Will the Media Buy Go Bye-Bye? Social networks. Consumer-generated media. Twitter. Foursquare. YouTube. Facebook. Blogs. Websites, even. With digital media there for the taking (or earning), what’s the sense in buying it? Digital advertising and media are certainly not going to go away. No media channel has ever been truly supplanted (movies didn’t kill live theatre, just as VCRs didn’t stop people from munching popcorn in cinemas, despite dire predictions to the contrary). But online advertising is certainly experiencing forced evolution, largely thanks to disruptive social technologies. Whereas a handful of years ago the digital display people complained bitterly of silos – of being cut off from the main event of the traditional campaign – there may now be a disconnect on the other side of the house as display advertising, still pretty firmly anchored in the world of direct response, becomes disconnected from social campaigns. How should marketers integrate display advertising with social media? Does one drive the other, or do we have Dr. Dolittle’s hybrid pushmi-pullyu on our hands, the fabulous animal who could do two things at once (or struggle mightily to do nothing at all)? It’s clear that creative and media buying strategies must be adjusted to accommodate a display/social world, particularly as online brand advertising (as opposed to direct response) continues to rise. 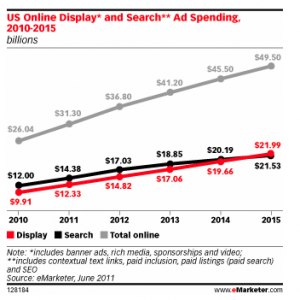 Emarketer, for one, predicts that by 2015, display ad spend will finally supplant search spend. The agency role in the new My vs. Buy ecosystem will, of course, be re-evaluated, as will measurement. Impressions, clicks, virtually all measurement standards are up for assessment and new forms of standardization, as a consortium of the major advertising trade associations announced yesterday. As the landscape rapidly evolves, we’re still in a period of more questions than answers, but asking the right questions is a critical first step in coming to terms with tough decisions about allocations between marketing and advertising, of build vs. buy. If you’re interested in these questions - and in the San Mateo area next Thursday, Sept. 29 - consider joining my colleagues and I for a discussion at the Altimeter Group’s Hangar. Request an invitation here. Read more about Will the Media Buy Go Bye-Bye? How Do You Measure Content Marketing? Content marketing: what are you measuring? And why? I couldn't be happier that Jim Sterne's eMetrics Summit will at last come to New York, and am honored to be speaking at the event. The session is entitled Congratulations, You're a Publisher! Content Marketing Metrics. My hypothesis is that content marketing is, essentially, publishing. To measure its effectiveness marketers must rely on many of the metrics and benchmarks publishers look to: page views, time on page, "engagement" (yeah, whatever that is), repeat visits, and, of course, visitors who take desired actions. Some companies, such as Eloqua, are able to directly attribute millions of dollars in revenue to downloads of their eBooks. That's where we come back to the question at the beginning of this post. If you're marketing with content, whether on your own web site or in social media channels, let me know in the comments or via email if you prefer what you measure, why, and how. This can apply to your own content, of course, or even metrics used around user-generated content about and around your brand, products and services. Thanks in advance for your input. And if you're at eMetrics next month, hope you'll say hi. Read more about How Do You Measure Content Marketing?